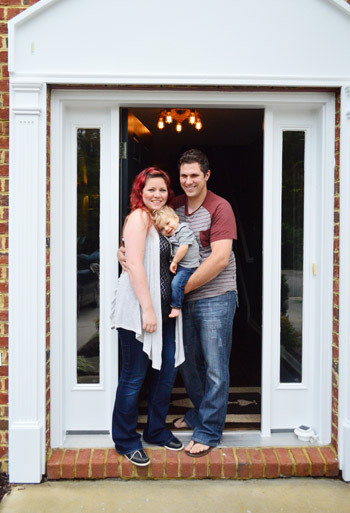 We know you guys love seeing a wide range of homes when it comes to House Crashing, so when Katrina invited us over to run around her townhouse and snap some photos to share with you guys, we jumped at the chance. She’s a super creative momma who lives right here in Richmond with a lot of awesome found/collected items mixed with things that she has DIYed herself. And here she is now, with her adorable son Luke and her husband Nate. 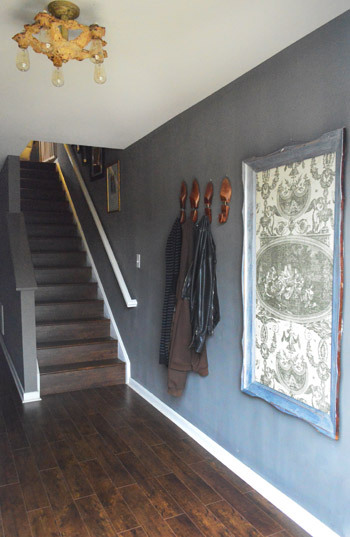 When you enter the townhouse, there’s a gorgeous cozy wall color (Gauntlet Gray by Sherwin Williams) that envelops you, along with the rich wood floors that her hubby installed himself on all three floors. Everything from the vintage light fixture to the quirky wooden shoe-molds-turned-coat-hooks really makes the space feel one of a kind. When you walk upstairs there’s the living room, which is painted the same rich color, but has a lot of lighter pops (in the furniture, the mantel, etc) along with pretty frames and mirrors to bounce around a lot of light. The starburst mirrors are from Target but Katrina used Grecian Gold Rub-N-Buff from Michael’s on them to get that gilded look. Those paper butterflies were actually something Katrina bought on Etsy (from a shop called Embellished Paper) and pinned to an old pallet to cover up the hole that the townhouse builder had left over the fireplace for a TV (she didn’t think putting a TV in there made for the best furniture arrangement since the fireplace is on an angle). 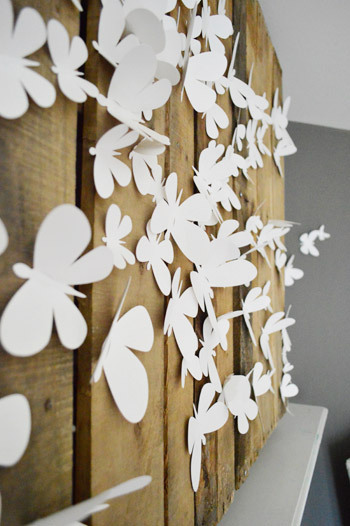 I loved the mix of the rustic wood and the delicate white paper butterflies. And here’s little Luke modeling his play area, which is a mixture of old and new (and DIY and store-bought). The bookcase is from Ikea, but when it’s mixed with the old map, the oversized clock, and the mason jars that Katrina painted white and hung on the wall, it has a casual and eclectic feeling. … and this is what it looks like now. I love how the dark walls balance the light furniture and the large frames add color with those cheerful yellow squares. 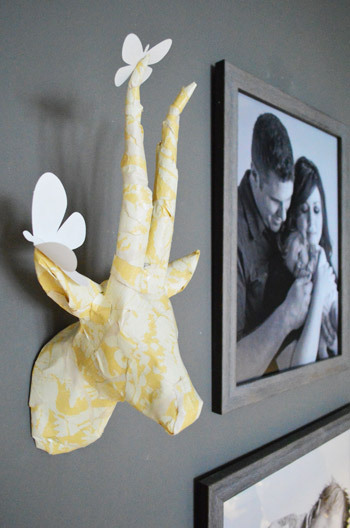 Katrina just grabbed some Ikea frames and used yellow paper and some inexpensive medallions from the craft store that she spray painted silver inside of each frame to create some architectural art for a steal. I love that Katrina isn’t afraid of making her townhouse stand out from all the others. 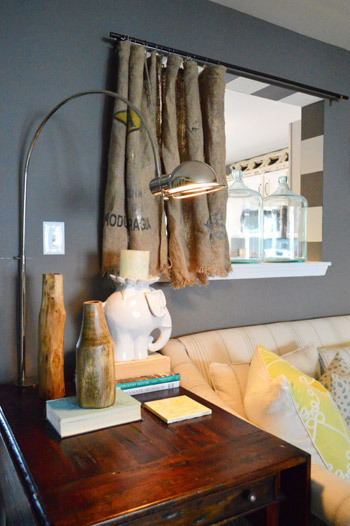 No detail is too small for her, and I loved noticing small upgrades that she added, like the wide stripes that she painted just on the inside of the pass-through to the kitchen, and the burlap curtains that she added (she made them from old grain sacks herself). Here’s the view of the pass-through from the kitchen. I thought the fact that the grain sacks had designs on both sides was so smart (they’re like a double sided curtain with tons of texture and a cool collected feeling). And you know I wanted to rub my face all over those gleaming over-sized glass containers. Katrina’s kitchen also brought a giant smile to our faces because the same gray penny tile that we used in our last kitchen was just sitting there, waiting for me to pet it. So I did. The dark wood counters and the painted cabinets with cool dark Ikea hardware stole my heart too. But my favorite part of the kitchen was the awesome built-in banquette that Katrina and Nate added to the other side of the space. The giant white mirror almost felt like a window, and the shelf on top with pretty decorative baskets added extra storage. I’m a huge fan of Katrina’s lighting and furniture choices too. They just looked easy yet really elegant. The chairs and table are both outlet finds here in Richmond (from The Decorating Outlet). Mirror detail. Me-ow. Katrina bought it at an auction in Lynchburg for a steal. 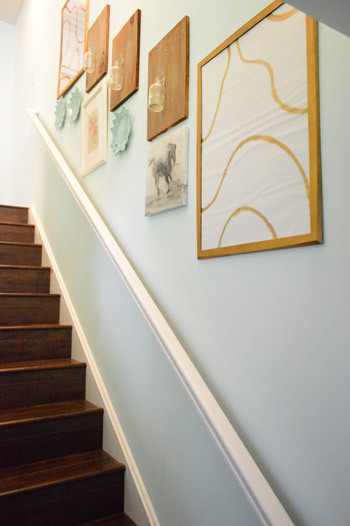 Katrina used the same cozy and rich gray tone on the walls of the first and second floor, yet on the third floor where all the bedrooms are located, she lightened up with this soft and gorgeous blue tone (Oasis by Olympic). Walking up to this floor definitely felt airier and softer, which was a nice distinction for the bedrooms I think. And of course the art on the stairs had me at hello. I especially loved the wood planks with vintage glass bottles that Katrina wired up herself. 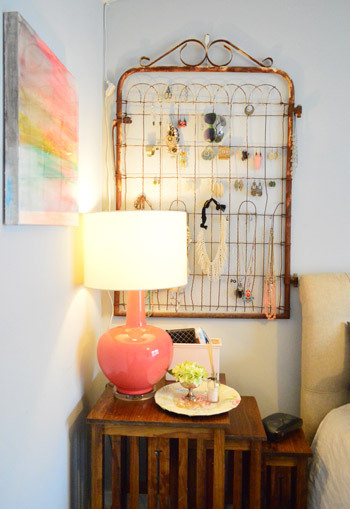 … and the oversized coral-pink lamp (it picked up some of the tones in Katrina’s homemade art that was hanging above it). She used pastel crayons on a canvas to make the art and then poured thick clear resin over it for a polished look (you can grab resin to DIY your own version at Michaels or JoAnn’s). The nursery was really charming too, with light colored furnishings and a sweet tree decal kit on the wall, which Katrina made her own by adding little chalk creatures poking out of the trees. 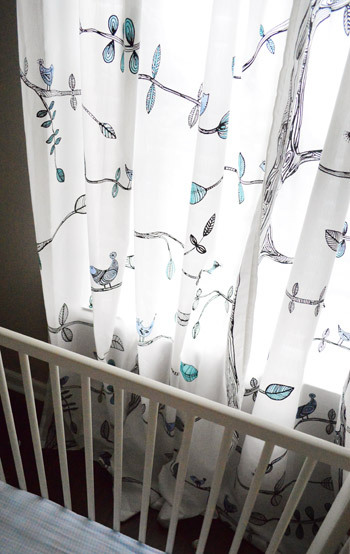 I wish the wider shots of the room had turned out, but we did manage to snag this curtain detail that captured another one of Katrina’s tweaks that was really charming. She took inexpensive Ikea curtains and colored them just using a regular old sharpie for a watercolor-ish look that was painterly and whimsical. So thanks so much to Katrina for opening her house up to us and letting us share all of the inspiration with you guys! Let’s play the favorite-part game. I’m calling the eat-in area of the kitchen, and John’s all over the color palette shift that occurs when you transition upstairs (it really felt like you were up in the clouds on that top floor). Update: We just learned that Katrina used to have a blog, so although she no longer updates it we thought we’d share it in case you wanted to check it out. Woot! Lynchburg shout out in this post! Wonder what auction…I haven’t found anything good like that at an auction here (here being Lynchburg where I live). What an amazing space though! I love all the vintage/DIY touches. Just amazing! When I lived there, they auctioned off some model home decor on Liberty Mountain. I snatched up the mirror! Lynchburg has a lot of great places to find things downtown. I actually miss shopping there. I saw something similar to those jugs at Target! I live in Pennsylvania, though, but you might want to check online! The jugs are actually old “water cooler” bottles. They used to make them from real glass instead of plastic. I see them from time to time at salvage yards or antique malls. If you have some locally you could check there. That was my favorite house crashing yet. I wish I was that creative. You Richmonders really know how to decorate! Gorgeous! I have a real love of cool greys and I love how she use them here. Beautiful! She did such a great job! Wow, I love this house crash. 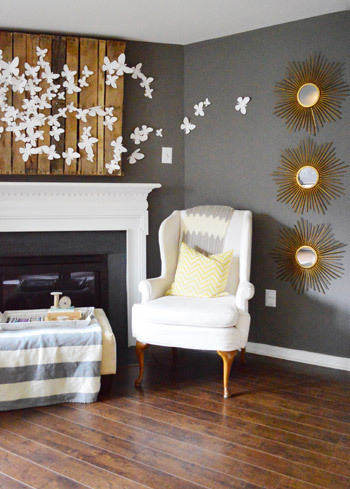 Her decorating style is fabulous! What a beautiful home. I love the curtains in their boy’s room! Katrina needs to do this professionally! Her house is GORGEOUS! I’m a huge fan of bold, rich colors and bright pops. She nailed it! Love the house! Don’t they have a blog? By the way: Your new house is turning out awesome, too!!! I don’t think Katrina has a blog but if she starts one we’ll definitely link to it! Beautiful Home! Speaking of blogs, Have Fun at Haven, that’s this weekend, isn’t it? I read it on some other blogs, but hadn’t heard it from you guys yet? Break a Leg! ha. Thanks Kathy! We can’t wait! I actually have a dormant blog called Design Fabulous. I put it on hold when I had my son Luke. YHL, doesn’t need to link to it since it is not active but if you want to drop by and see some old posts about the house, it is there. Maybe I will be inspired now to start it back up. Thanks Guys! No way! We’d love to link to it Katrina! Thank you for telling me! Do you have the link? Thanks Katrina! Will add an update with a link! I’m glad you guys crashed a townhouse. I had a lot of favorites, the shoe molds as coat hooks tops the list! I liked the mirror in the kitchen and the hanging lamp over the table a lot too. I love love love this town house! It’s super cool! 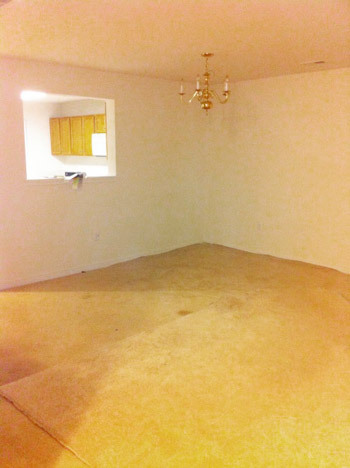 I especially love the eating area! That mirror is super druper cool! Love it! FYI, that’s not a screen in the master bedroom, but an old gate from a fence. Had one something like that at the house I lived in as a toddler. Fashion trends surely do go in cycles, lol. That gate is one of my favourite pieces. It looks great! 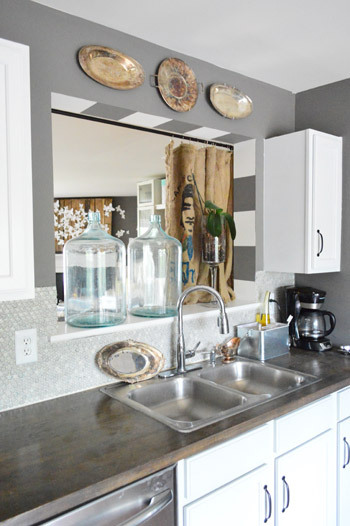 Coming in a close second is the mirror/window in the kitchen and third, the glass jugs on the pass through. Great personal touches! Wow. I love the small details in her space. Super cool house crash! 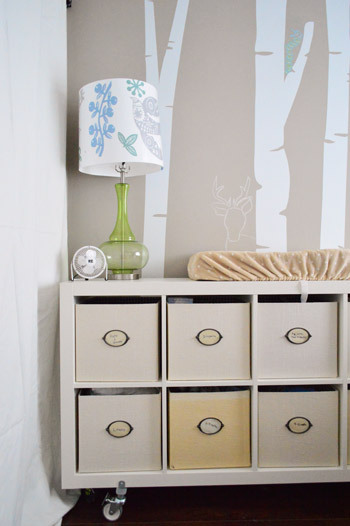 Aaaand I’m stealing the painted mason jar idea for our nursery. The walls are aqua, and so are the jars, so I’m excited to see how they look painted white on the inside. Also/and I am kind of obsessed with their striped cut out window thingy. OBSESSED. Wahoo! Not weird at all. Just exciting for two people like us with a house crashing habit. gosh everything about this house is amazing! 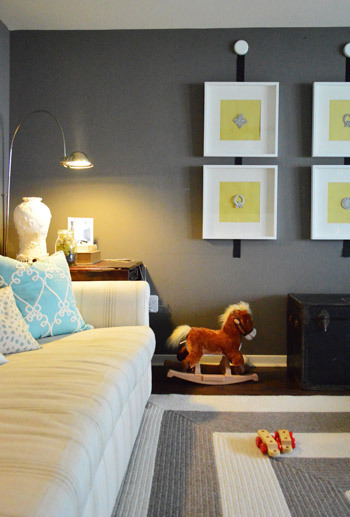 i especially love the gray walls! but then all the accent pieces look so much fun! The entry way is rather dark for my taste but the kitchen is really nicely done. That’s from Shades of Light (I asked because I was in love with it too, haha!). Thanks for asking that. I jumped up when I saw it! Just what I was looking for! I’m also glad you guys crashed a townhouse too. I love the gray and yellow colors in the downstairs, and the stripes on the pass through was AWESOME. Very inspiring! Thanks Katrina for sharing! LOVE! Awesome crash!!! Really enjoyed looking at this house – it gave me several ideas about things to DIY that aren’t the same but inspired by…TOTALLY love when that happens! Love this! It’s also so nice to see a townhouse/condo crashed since that what my husband and I currently own. Katrina’s style is fabulous! Oooh, I love this! My favorite is the strips inside the kitchen pass-through. Such a great detail and makes it look so polished! the wooden shoe detail at the front door is the greatest thing. and the mantle. and the stripes between the kitchen and living room. don’t make me choose just one! Wonderful tour. Lots of things to like but I’m wondering where she got those lamps that flank the sofa – and are they floor lamps or table lamps? Those lamps clipped to the side tables, and I think they we’re from The Decorating Outlet here in Richmond. Wow, that is GORGEOUS!!! I would never have thought colors that dark would work in a townhome but they have balanced it perfectly! She’s got some great funky taste too! Does she have a blog?! I love her style too! Awesome job making the townhouse their own!! We always link up if there’s a blog, so here’s hoping she starts one! Yup! She’s got style. I love the mix of old and new. Where is her fabulous kitchen ceiling light from? I think that’s from Shades of Light or The Decorating Outlet. It is from the Decorating Outlet. Love that place! I think Katrina would be awesome at consults! One of my favourite house crashes ever – well done Katrina! Gives me more confidence to experiment with our townhouse! 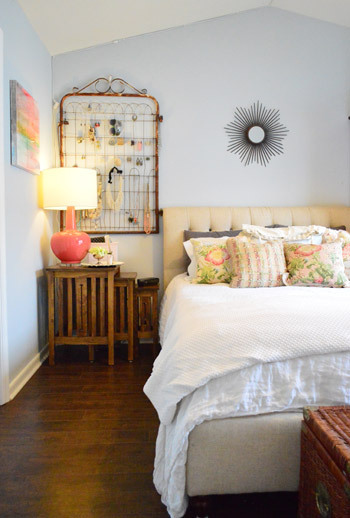 Cozy & creative, indeed – very nice! Wasn’t her living room just published recently? Can’t remember where, unless you gave a glimpse with a photo previously…..? Ooh where? It wasn’t us! I’m dying. This is the most fabulous town home I’ve ever laid eyes on. I agree that she should do this professionally or AT LEAST start a blog to share her ideas. AWESOME, AWESOME, AWESOME! :) One of my favorite house crashes to date! Ooo, between the pallot with the butterflies trailing off, the map of Richmond, and the eat in area, I cannot pick a favorite. Seriously though, if Katrina is reading this where did you get that map? I’m also totally going to pitch that eat-in area to my wife (our kitchen happens to also be a darker grey with white trim). We’ve both thought that would be cool before we bought our house and for some reason I haven’t thought about since. Hope she drops in with that info for ya! love the map too! hoping she drops in as well! The map was a sample at Shades of Light outlet here in Richmond. However I am pretty sure they will be adding it to their website soon for sale. I am also in love with the map! (And everything else in your place, Katrina!!) I called SOL, and they said the Richmond version will be for sale in 2014. Right now they have New York and Chicago on sale. I love that view of the kitchen with that awesome mirror! 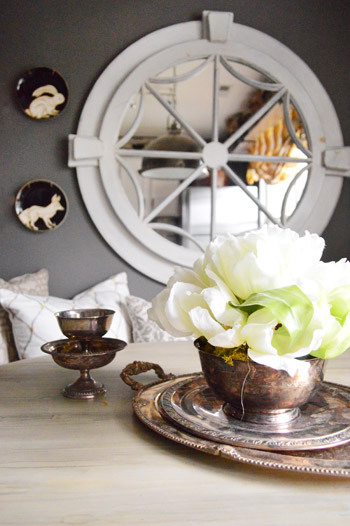 She has such a great eye- that before photo of the living room is just blah and she turned it into such a great space with so many awesome details. Her house is gorgeous! She knows what she likes and goes for it. Still working on that lesson here. 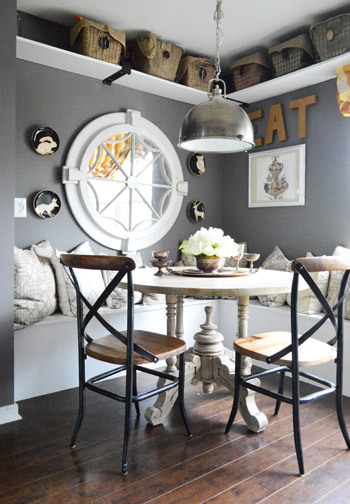 That banquette is awesome! I love how it must feel like a cosy table for two when they eat just the two of them but still could fit a whole family! Palette = surface used for mixing colors. I believe you are referring to a pallet above the fireplace. Sorry about that Tammy! All fixed! LOVE the Richmond map! This is going to sound terrible, but at first glance I thought the clock next to it was framed by a toilet seat. I was waiting to read about how she’s re-purposed a toilet seat into DIY art. So glad it’s just a clock! I love the Richmond map too! What a gorgeous home! I love the rich color of those wood floors and am dying over the living room. Could it be any prettier??? oh my gosh what an AWEEEESOME house!!! loveee the living room and kitchen so much! What an awesome home! I’ve never even been to Richmond, and I’m ready to go out and buy that map! Love all the textures and different pieces they’ve collected over time. Remarkable!! Really love the butterflies in the living room. Where did she get the storage bins for Luke’s room? Hope she drops in with that info! The storage bins are Ikea. I love them too! Love! 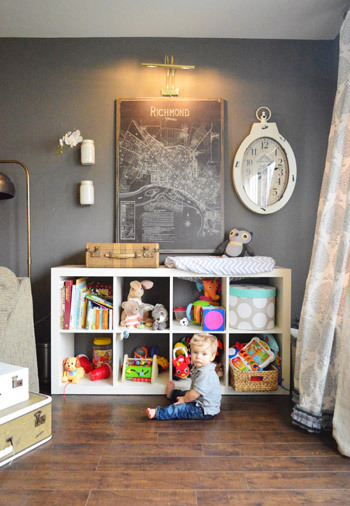 Especially love the little play area….we are trying to figure out how to neatly incorporate a play area in to our little home so this is inspiring! Does anyone know where to get that city map art? It was a sample from Shades of Lights Outlet, however I am pretty sure they will be carrying it soon. So keep an eye out for it. What a beautiful home! Thanks so much for sharing it with us! Any idea on the source for the rug in the living room? That’s from Shades of Light. Scrumptious. Thanks for sharing Katrina. 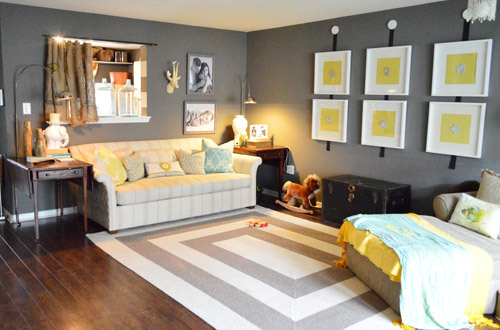 Love the rug in their living room! Any idea where it is from? Shades of Light here in Richmond.